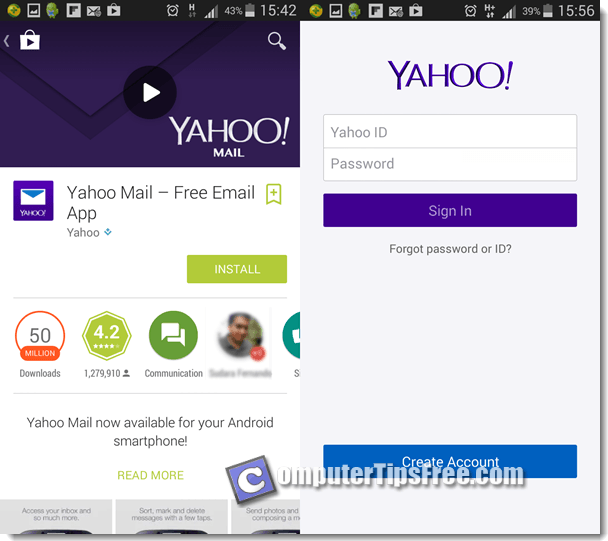 In this post, we will show you how to login to your Yahoo Mail quickly on your Android or iOS mobile phone. We will also talk about several account security issues and things you may want to do to better secure your account from hackers. We are writing this as experienced Yahoo users. We do not represent Yahoo and we are not affiliated with Yahoo in any way. If you have problems with Yahoo Mail login on your desktop computer, visit Yahoo Mail Sign In instead. On your Android or iOS mobile phone, you can login to Yahoo Mail either from a browser such as chrome or safari or via an app created by Yahoo Inc. We recommend you to download the app and use it instead. It’s much easier and convenient to use. It will update itself automatically so you get to have the latest features and interface updates. To do so, first head to Play Store on an Android mobile phone (or App store on an iOS mobile phone), search for Yahoo Mail login and install it, or go to this link if you’re reading this on a phone. After the installation is done, head back to your home screen and open the Yahoo Mail app. The Yahoo Mail login form will appear upon launching the app. Proceed entering your Yahoo ID and password as you would on a desktop computer. You will then be redirected to the Yahoo Mail inbox page. Yahoo and the Yahoo logo are trademarks of Yahoo! Inc.
To login to Yahoo Mail via browser such as chrome or safari, just open up Yahoo.com and click on the email icon. The icon will usually be on the upper right corner of Yahoo.com homepage. By clicking on this icon, it will open up Yahoo Mail login page. Enter your Yahoo ID and password and you will be redirected to the inbox page. Make sure you’re on the correct URL address before logging in. There are many phishing sites trying to steal your account by leading you to their fake sites that look very similar to the real original ones. Well, it explains why it’s better to login via the Yahoo Mail app. 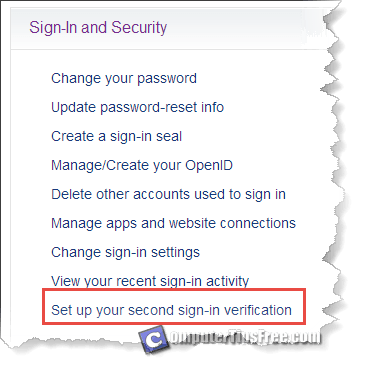 To better secure your Yahoo Mail login account, you should enable the second sign-in verification method in your account. After it’s enabled, whenever you sign in to your Yahoo Mail account, you’ll receive a code via SMS on your mobile phone. You’ll have to enter this code in order to complete the sign in process. With this feature enabled, anyone who manage to steal your account sign in details won’t be able to sign in with just your Yahoo ID and password. Unless of course if they also have your phone with them, otherwise no one else can login to your account without you knowing. To enable the Yahoo second sign-in verification, first sign in to Yahoo Mail. From the inbox page, click on the setting icon on the top right corner and then “Account info”. On the next page, under Sign-in and security, click on “Set your Second Sign-in verification”. Follow the on-screen instruction to complete the process. If you ever forget your password or need help accessing your account, click on the “I can’t access my account”. Select “I have a problem with my password” (or whatever else problem you are actually facing right now) and then click Next. Follow the on-screen instruction to complete the password reset process. Usually you will need to enter your Yahoo ID and an email will be sent to your secondary email (the one you entered when you register with Yahoo). With that email you’ll be able to reset your password. Also, if you’ve previously provided your mobile phone number to Yahoo, a code will be sent to your mobile phone and you can use it to reset your account’s password. You are advised not to stay signed-in if you’re using a public computer where everyone can access. Whenever you login to your account, there’s a check box in the Yahoo Mail login form called “Keep me signed in” and if you tick that, the next time u visit Yahoo.com you will no longer need to sign in. If you’re using a public computer and you tick the stay signed-in option when you login to Yahoo Mail, the next person will be able to access to your Yahoo Mail account if you didn’t log out. So, please be careful if you’re using a public computer. Well, everything written here or anywhere else on this blog is purely my experiences from trials and errors and that I think would be helpful to the people. They may not be updated as time goes by. If ever in doubt, please visit Yahoo official Help site for latest info: http://help.yahoo.com/l/us/yahoo/edit/forms_index.html.